I was intrigued by the scenario. When she was eight years-old Peggy’s father told her that the situation he feared had come to pass. The world had ended and everyone was dead, except for the two of them. They were still there because he was a survivalist, because he been preparing for what had happened for years. He took her away from their London home to live in die Hütte, a wooden cabin, deep in a remote forest somewhere on continental Europe. He lied. The world hadn’t ended. Her mother wasn’t dead. The world continued to turn without them. But they lived in the forest for nine years …. The story opens in 1985, when Peggy is seventeen years old, and has returned to her old London home, with her mother and the nine year-old brother she hadn’t been there to meet. She is adapting to the change in her life, and the new knowledge that change has brought her. She is thinking of the hot summer of 1976 when her father taught her survivalist skills while her German mother, a celebrated concert pianist, was away on tour. And she is thinking of those nine years, how they began, how they survived, how things changed, and how they ended. Her voice is lovely; naïve, confiding and utterly compelling. I was captivated and because of that, and because her perspective was held so perfectly I didn’t worry about all those practical questions about what happened and about how ever it could have happened. At first Peggy enjoyed the adventure, setting up a new home, exploring the woodland all around, and finding a new and very different way of living. Her descriptions were lovely and so very evocative. They drew me right into the story. When winter came, and snow fell, Peggy and her father were trapped in die Hütte. and food and water ran desperately short. I feared for them, and because I perceived him with adult understanding and Peggy’s understanding was still childish I found more reasons to be fearful. Over the years Peggy learned and understood more. She began to question her father’s authority and judgement. And she began to realise that her father’s obsession was turning into madness. That was why when she saw signs that they weren’t alone, that someone else had survived and was living in the forest, she said nothing to her father and set out alone to try to learn more …..
Claire Fuller has woven together elements of dystopian stories, elements of grown-up fairy stories, elements of psychological studies, to create a first novel that is so very distinctive. And there’s more than that. This is a story underpinned by wonderful understanding of different relationships. First there is the relationship between a husband and wife who have grown apart but stayed together; then there is the relationship between father and daughter that evolves in the most extraordinary circumstances; and finally there is the relationship between mother and daughter that has, somehow, to be rebuilt. There are interesting touches, there are lovely idiosyncrasies – thinking points would be the right collective noun, I think -in all of the aspects of the story; I could write reams, but if you’ve read the book you know, and if you haven’t you should it’s lovely to find these things and to think about them as the plot and the relationships evolve. The evolution of the plot and the relationships made this story utterly compelling. As it moved backwards and forwards in time I had to keep turning the pages to find out exactly how Peggy got home. The answers to my questions – and the end of the book – came quickly. It was unexpected, and yet it was utterly believable. I might have worked it out, I might have spotted the clues, but I didn’t. I was left with questions about Peggy’s reliability, questions about exactly what happened, and question about what would happen after the final page. But I was left with no doubt at all that this is a wonderfully accomplished debut novel. « We are home again …. Very thoughtful review, Jane. I’ve seen a lot online about this book, but you’ve really given me the sense of what it’s about. Ah good, that different people have found different things to focus on speaks so well for this book but I wanted to focus on the human drama. I haven’t heard anything about this book yet, but it sounds excellent. Though I think I would want to know before reading if anything really bad happens in the cabin (not that you need to answer here). It’s really difficult to explain without saying too much, but I can say that there are dark and serious elements to this book , and that they are well handled. My gosh Fleur, this sounds amazing. One for the TBR, and quickly, I think. Great review, my interest has not been snagged – it’s been knotted up tightly! Excellent! I think you’ll find much in this book to keep your interest.- I’ve only scratched the surface. So many great reviews of this book now I must read it. Great review. I’ve not heard of this and it isn’t perhaps the type of book I would usually go for but it sounds fascinating. It’s not the kind of book I read often, but I saw so any people praising it and tipping it for the Bailey’s prize that y curiosity was piqued. This is probably the best review of this I’ve read, Fleur (I love that name, so I tend to use it instead of Jane!) I have an ARC, and wasn’t sure how “me” it was, but now I’m really looking forward to reading it! Kaggy’s comment is bang on – there’s been a lot of talk about this book, without any attempt to tell us what it’s all about – and you’ve done exactly that. Rather frightening, I would have thought, for Peggy to realise that not only was her father lying but he was possibly insane…Lady F is always enthusiastic in her praise of your reviews; I can see why! The writing is nicely understated, and that allows plenty of room to consider all of the questions like that that the story throws up. I think that Peggy’s realisation was gradual, and of course her perception would have been affected by her own situation. Beware of Fleur, crimeworm, she endlessly builds my TBR sky high. Not on the galley any more, this one, so I’ve done the thing with coin! Well, card, to be honest, and it’s on the frighteningly expanding Kindle TBR. Fleur is a dangerous blogger! Ah well, at least a virtual TBR can’t topple, and you’ll always have a book on hand …. Kindle TBRs are particularly dangerous as they’re hidden away…! I was checking in a charity shop the other day on my Kindle if I had a book by an author whose surname began with H, and it was mortifying how long it took me to scroll to it! The girl next to me was a book freak too, so she just laughed, but I did think to myself, this is ludicrous! I’m looking forward to reading this book now, whereas before I thought it was a book for really brainy people and most of it would go over my head – but Fleur has, unlike other blogs, told us what it was about! I’m now looking forward to it. I had a WOW! 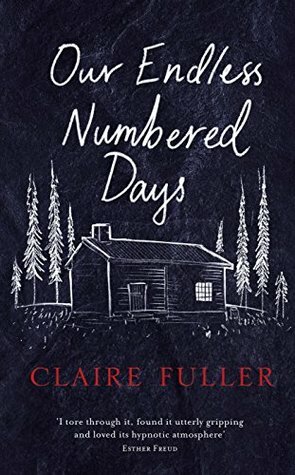 moment of excitement when I saw Claire Fuller had visited my blog earlier – I was ridiculously excited! CLEARLY this is a sign to read the book asap! Yes I’d noticed you’d mentioned Fleur re Broken Harbour – I should’ve made note to stay away then lol…! This is the best book I’ve read this year! I love your take on it too. Must check out your review, Annabel! The more I read about it, the more intrigued I am. Can’t wait to read mine, as soon as I’ve finished what I’m doing! This book sounds so interesting, I’m going to have to add it to my TBR Pile/Kindle wish list. Thank you so much for the review.